"Medium" is now the more commonly used term for the “Klein” or "Moyen" poodle size. Moyen means medium in French. Klein means small or mini in German. The term Klein is used in Germany only. Moyen is the French term used on and off now by FCI Fanciers, but in the past Moyen has been used by FCI over the decades. The Poodle breed is called Caniche in French. France is the homeland for the Poodle breeds per the FCI (The Fédération Cynologique International, the world canine organization of 94 countries). The Poodle breeds are often referred to in the French language in FCI registrations and shows. 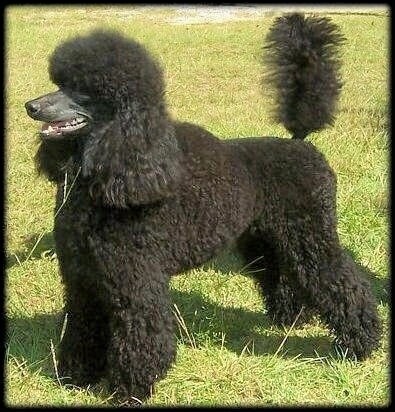 This medium size falls in between the Miniature and Standard Poodle, but it is not obtained by crossing the two; it is an actual fourth Poodle breed size in Europe and is not a new size. This medium size poodle is very common in the U.S., but because they are small, they are generally placed in pet homes, as they cannot successfully compete in the AKC ring against their larger counterpart, the Standard. However, they can compete in the UKC conformation venue and many are champions. Mediums tend to be in the 15-20 inch range, the size of a small Standard Poodle. Here in the U.S. Mediums are shown in the Non Sporting Class. In the UKC ring, they show in the Gun Dog Group. When groomed to show dog standards the body is meant to give off a square appearance. It has approximately the same length as the height at the withers. The skull is moderately rounded with a slight but definite stop. It has a long, straight muzzle. The dark, oval-shaped eyes are set somewhat far apart and are black or brown. The ears hang close to the head and are long and flat. Both the front and back legs are in proportion with the size of the dog. The topline is level. The tail is set and carried high. It is sometimes docked to half its length or less to make the dog look more balanced. Dewclaws may be removed. The oval-shaped feet are rather small and the toes are arched. The coat is either curly or corded. It comes in all solid colors including black, blue, silver, gray, cream, apricot, red, white, brown or cafe-au-lait. 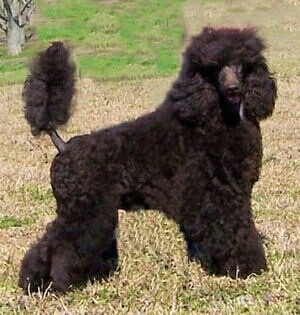 While it does not make the written show standard, some breeders are breeding parti-colored Poodles. 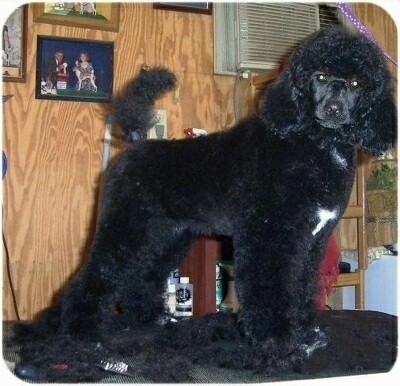 See grooming for different types of Poodle clips. The Medium is an intelligent, joyful companion dog. It can be trained to a high degree, and is very willing and happy to please its handler. Comical and clever, it is often used as a circus dog. The more intelligent a dog is, the more it needs its mind occupied. This breed cannot live outside in a kennel. It needs to be part of the family. It can be high-strung if not given the proper type and amount of exercise. Do not allow this dog to develop Small Dog Syndrome, where the dog is led to believe it is alpha over humans. It can cause the dog to become sensitive and nervous, and not very trustworthy with children and possibly strangers, along with many other behavior issues. Socialize your dog well. This is a very good watchdog for its size, seldom becoming aggressive. Mediums may start to bark a lot without proper human to canine communication, rules to follow and limits to what they are allowed to do. Poodles are friendly with other dogs and non-canine pets. Be sure you are this dog’s firm pack leader, in order to avoid any unwanted behavior problems. 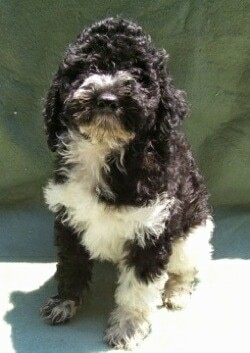 Falls in between the Miniature and Standard Poodle size. Not an official AKC size variation, however has become popular outside the USA. A long-lived breed, Poodles are, nevertheless, subject to many genetic diseases. Cataracts and progressive retinal atrophy may cause blindness. Allergies and skin conditions are common—possibly due to unskilled use of clippers or allergies to shampoo and/or color reinforcer. Runny eyes and ear infections are also common. They are also prone to PRA, diabetes, epilepsy and heart disease. Brown Poodles tend to become prematurely gray. Also IMHA (Immune Mediated Hemolytic Anemia). The Medium Poodle is good for apartment life. Given enough exercise, it is not active indoors. It will lie right next to you and is more sedate when indoors, although it loves to play outdoors and is a highly intelligent breed, so it does like lots of thoughtful activities to stimulate its mentality. This breed will do okay without a yard. Medium Poodles need a daily walk. While out on the walk make sure the dog heels beside or behind the person holding the lead, never in front, as instinct tells a dog the leader leads the way, and that leader needs to be the human. As with all breeds, play will not fulfill their primal instinct to walk. Dogs that do not get to go on daily walks are more likely to display behavior problems. They will also enjoy a good romp in a safe open area off-lead, such as a large, fenced-in yard. They adore water and love sessions of play. They are a very versatile breed with a hunting and retrieving beginning, although they excel in any performance event you offer them: agility, obedience, rally, conformation showing, and often one will leave one ring and go directly to another to compete again. Since they love water they are great dock diving dogs and love water retrieving. Poodles must be bathed regularly and clipped every six to eight weeks. Clean and check the ears frequently for wax or mites or infection and pull out hairs growing inside the ear canal. The teeth need regular scaling. Since the coat does not shed it needs to be clipped. There are several different types of poodle clips. The most common for pet owners is an easy-care clip called a "pet clip," "puppy clip" or "lamb clip," where the coat is cut short all over the body. Popular show clips are the English saddle and the Continental clip, where the rear half of the body is shaved, bracelets are left around the ankles, and pom-poms are left on the tails and hips. The AKC standard allows for a dog under a year old to be shown in a show-style puppy clip which has special requirements such as a pom-pom on the end of the tail. Other clip styles are the modified continental clip, town and country clip, kennel or utility clip, summer clip, and the Miami of bikini clip. 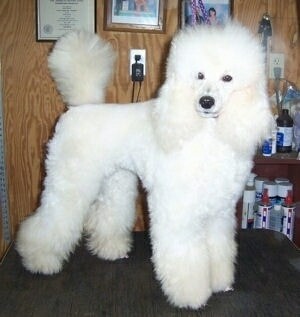 Poodles shed little to no hair and are good for allergy sufferers. The Poodle has been known throughout Western Europe for at least 400 years and is depicted in 15th century paintings and in bas-reliefs from the first century. The subject is controversial of where the dog was officially developed and no one really knows the breed’s true country of origin. France has taken a claim on the origin, but the AKC gives the honor to the Germans, where they say it was used as a water retrieval dog. Other claims have been Denmark, or the ancient Piedmont. What is certain is that the dog was a descendant of the now extinct French Water Dog, the Barbet and possibly the Hungarian Water Hound. The name "Poodle" most likely came out of the German word "Pudel," which means "one who plays in water." The "Poodle clip" was designed by hunters to help the dogs swim more efficiently. They would leave hair on the leg joints to protect them from extreme cold and sharp reeds. The hunters in Germany and France used the Poodle as a gun dog and as a retriever of waterfowl and to sniff out truffles lying underground in the woods. The French started using the breed as a circus performer because of the dog's high intelligence and trainability. The breed became very popular in France, which led to the common name "French Poodle," but the French people actually called the breed the "Caniche," meaning "duck dog.” The Toy and Miniature Poodle varieties were bred down from larger dogs, today known as Standard Poodles. In the 18th century smaller poodles became popular with royal people. The three official sizes are the Toy, Miniature and Standard Poodle. They are considered one breed and are judged by the same written standard but with different size requirements. 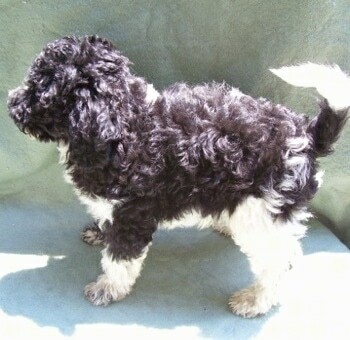 Breeders are also breeding an in-between size called a Medium Poodle, sometimes called a Klein Poodle (Moyen Poodle) and a smaller teacup Poodle. Some of the Poodle's talents include: retrieving, agility, watchdog, competitive obedience and performing tricks.